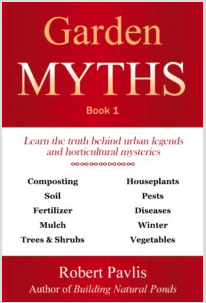 Anyone familiar with Ontario gardener Robert Pavlis’s factual and fun website, gardenmyths.com, will be pleased to know that Robert has just published his first book, Garden Myths. For those unfamiliar, but looking for a stout arrow to add to one’s quiver of gardening acumen, I recommend the book highly. Unlike my helter-skelter, seat-of-the-pants approach to quickly dismissing many of the foolish foibles plaguing the path to better gardening, Robert actually conducts scientific tests to discern validity (or lack thereof) of a wide range of horticultural urban legends. Plus, the guy actually grows houseplants, meaning that a portion of the book is helpful to gardeners who delve into that sidebar of gardening. I don’t grow any houseplants—by the time the frosts hit in November, I’m so sick of enabling plants outdoors, the last thing on earth I want to do is spend the next five months keeping an entire different crop alive. Is fall the best time to clean the garden? Will citronella plants reduce mosquitoes in the garden? Do pine needles acidify soil? Should trees be staked at planting time? Can burlap keeps your trees warm in winter? Will a pebble tray increase humidity for houseplants? A well-known speaker and educator with over 40 years of gardening experience, Robert is the owner and head gardener at Aspen Grove Gardens, a six-acre botanical garden containing over 3,000 varieties of plants in Guelph, Ontario. An Internet and email buddy of mine, I’ve always found Robert’s advice (and clear, friendly writing style) a welcome breath of fresh air. To head over to his website and learn more about the book, click here.